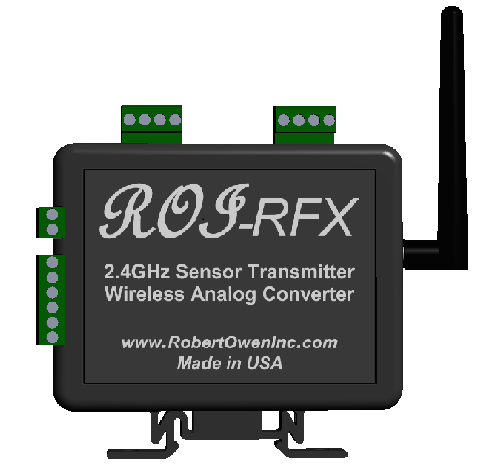 ROI-RFX Wireless sensor transmitter system - Robert Owen Inc.
Monitor remote sensors, sensor transmitters, and instrumentation signals with the ROI-RFX Wireless sensor transmitter. Signals recorded directly into Excel. Real time live data continually updates, adding new values to lists, charts, etc. PC USB connected, Windows compatible. Perform live analysis of your remote sensor data in your Excel spreadsheet. PC connected, by USB port, remote measurement of sensors up to 1 mile away. Create charts and graphs that automatically update with data from your ROI-RFX. Compatible software tools, turn Remote Sensor’s into Data Acquisition Systems. Bar charts, scatter plots, pie charts, all come alive with real time sensor data with ROI-RFX A-D‘sSoftware tools; turn Excel into a real time display and data acquisition program. Read remote 4-20mA transmitters using a wireless connection to your PC. Record remote industry standard 4-20mA sensor transmitters. Excel automatically updates real time with sensor measurement data. Sensor data can be used within Excel to perform real time calculations, display continuously updated status on graphs, etc.